When one of my very favorite kiddos turned 4 last year, I wanted to make him a gift centered around one of his very favorite things: Star Wars! I seem to recall my idea evolved from seeing this cute little finger puppet on Craft. 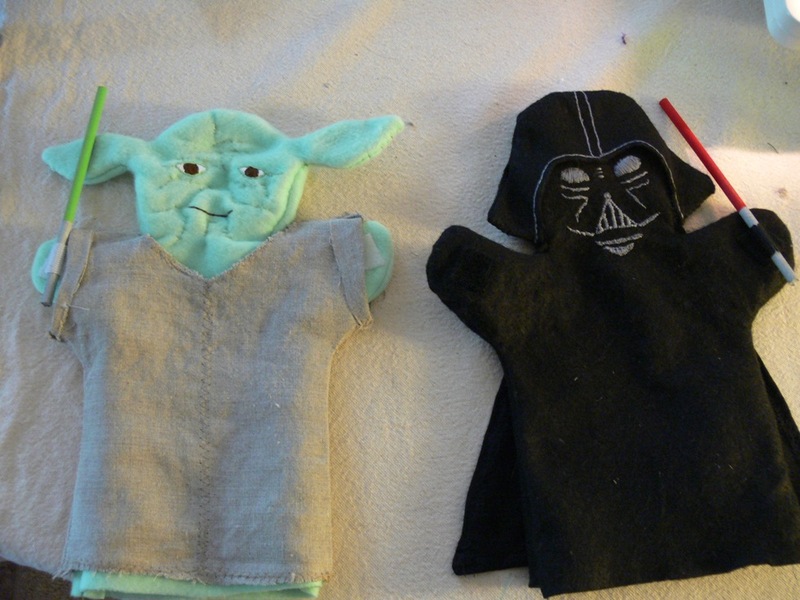 Star Wars puppets immediately seemed perfect and like the only thing I could possibly make for my buddy Ian. You've seen those puppets around your house for a while now. Here's the story (and a bit of a tutorial) on how they came to life. I wanted to find an artful way to display these quotes in my home and work area -- more than just a piece of paper on my bulletin board. 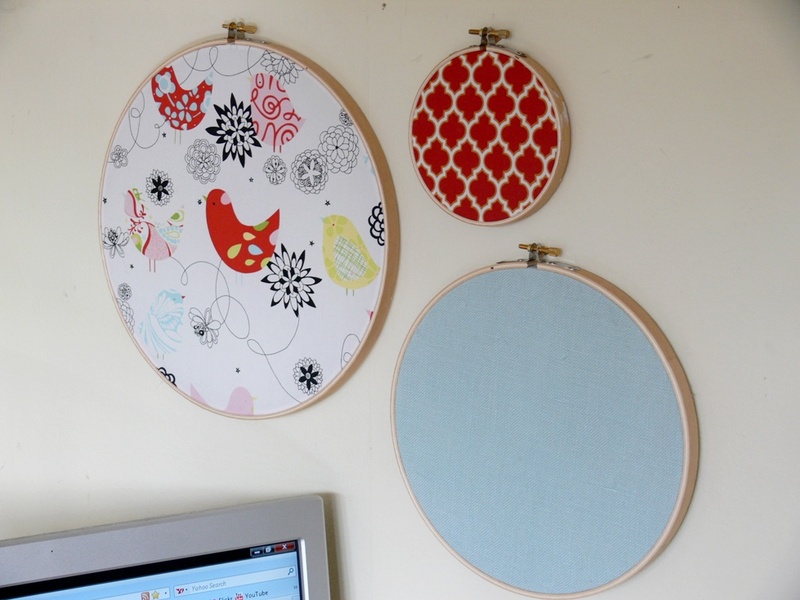 I had noticed and noted the embroidery-hoop-as-art trend on sites like SouleMama's blog and others. 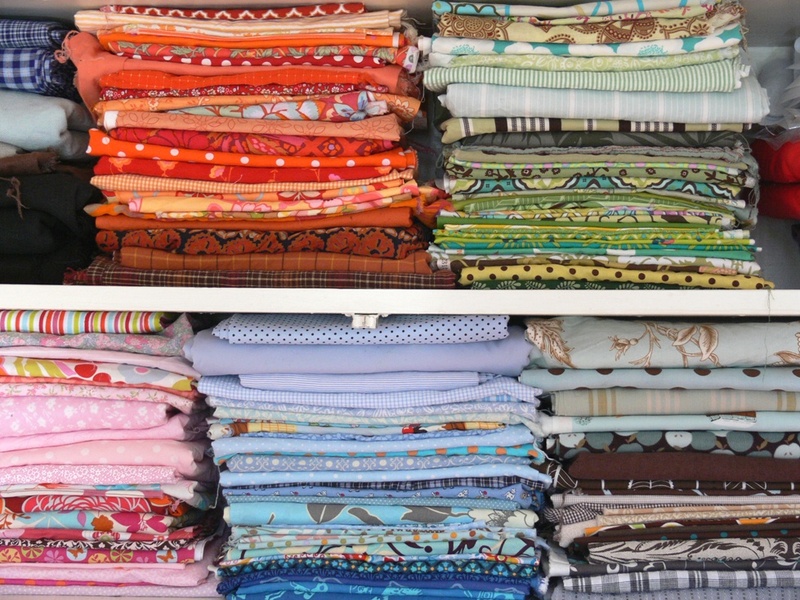 I also had some sweet fabrics in my stash that I knew I may never have the heart to part with -- perfect for displaying. Little by little, my inspiration project came together. 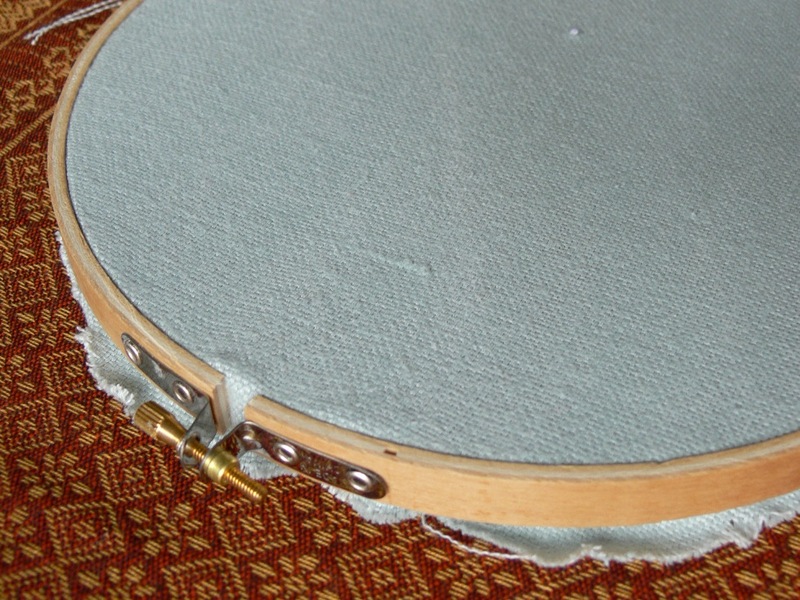 As you know, embroidery hoops can be found for the change in your pocket at your local craft store or, if you're lucky, at a nearby thrift store. I happened to have these 3 in my craft boxes. 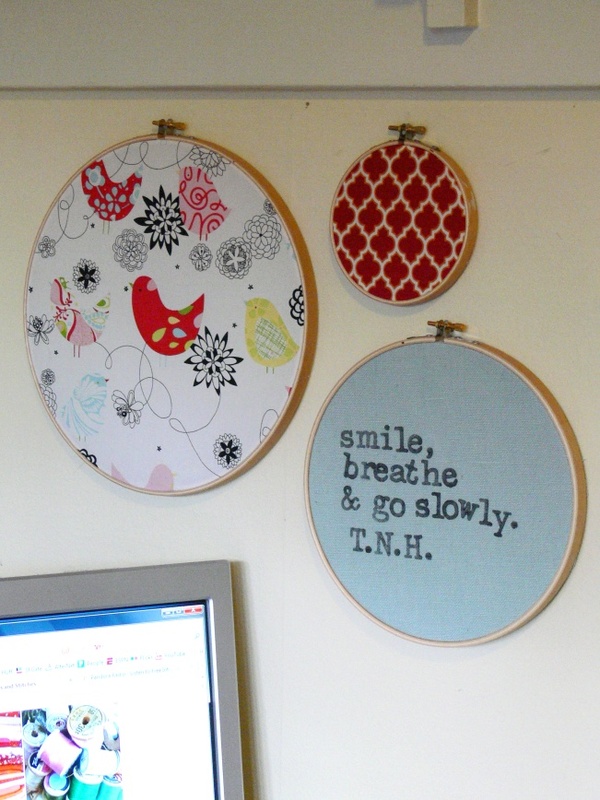 I framed the small design print in the smallest hoop, the busiest print in the largest hoop, and I kept the medium one for a coordinating light blue linen from my stash -- the canvas for my inspiration quote. 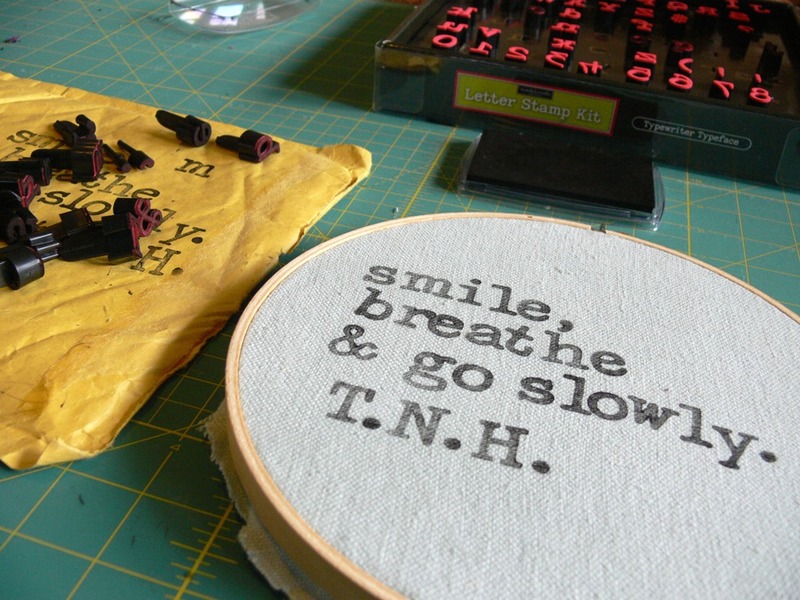 The last step in my project was to stamp my inspiration quote on the "canvas" linen hoop. I have a fun set of stamps I bought a few months ago. I love the rough typewriter typeface and the fact that they are easy to grasp when stamping. However, I don't quite yet know how to use them properly, including how to stamp in straight lines! The result is a bit... less pristine and inspiring than I was hoping!! I am thinking this specific stamp alphabet may be a bit too large for the hoop. Fortunately, I have a lot of linen left in the stash and can easily redo this one with a different set of stamps, or something different. I'm not sure yet. But I'll take a deep breath and take my time before I toss it all back in the craft box. What do you think? 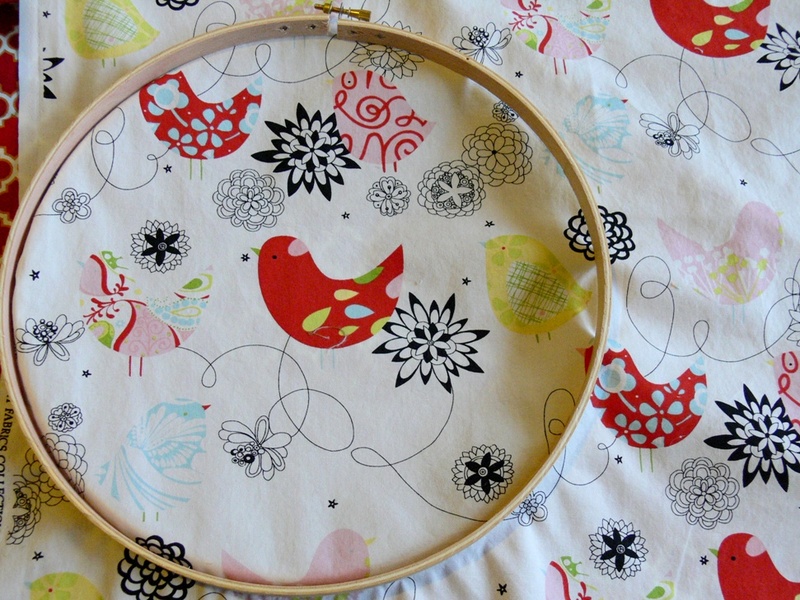 Update: I have gone back to scratch on the inspiration hoop. The stamping made me cringe. 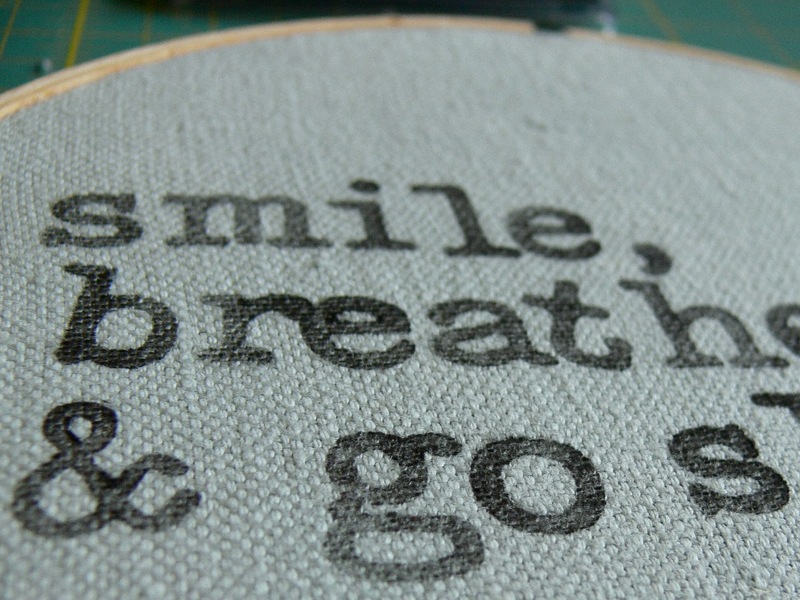 I could embroider the quote, since it is an embroidery hoop. But, my embroidery skills are not great. So I’m debating between that and trying out another stamp. If I had a working printer at the moment, I might also try designing and printing a nifty iron-on transfer. I’ll post again when I’ve figured it out! Update 2: I think I'm going to embroider that sucker after all. I am thinking a nice, cursive font and a little birdie to tie it all together with that awesome Alexander Henry print in the the large hoop. Hit me up with some good birdie patterns if you have 'em! I'd go for the embroidery! You have to learn sometime. And since this is a decorative piece you don't have the pressure of getting it done like if it was for a gift or something like that. You know Thich Nhat Hanh is one of my favorites, his writings have been influential in my life. I really love these! 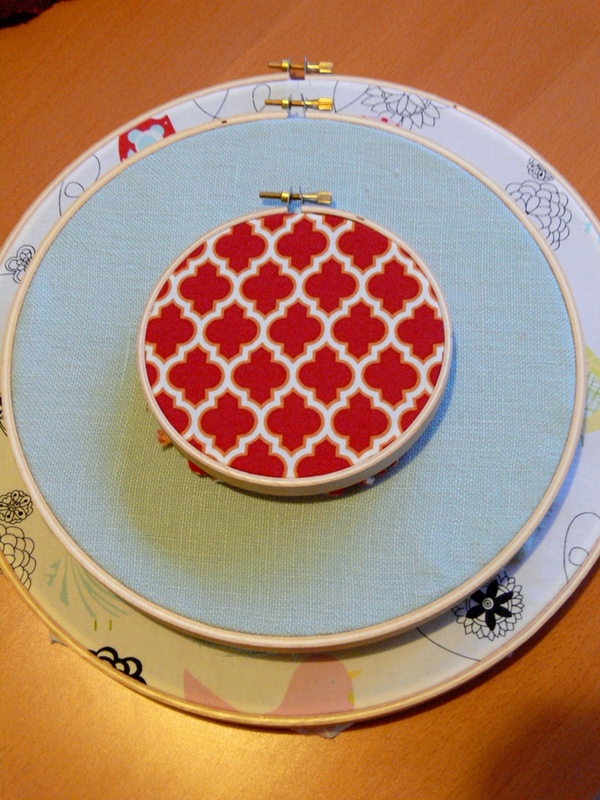 I find embroidery hoops from time to time when I am thrifting and always pick them up. It's really time to put them to use! You might have some luck finding bird templates at Martha Stewart's website. She has a thousand templates on there, it is crazy how many pop up when you type in "bird template". I am looking for a few good templates too, so I can make a few framed pieces for the bathroom after it's painted and we get a new shower curtain. I'll let you know if I find any that are perfect! As I've gushed to you previously, I find the blog Maya*Made inspiring and just lovely. 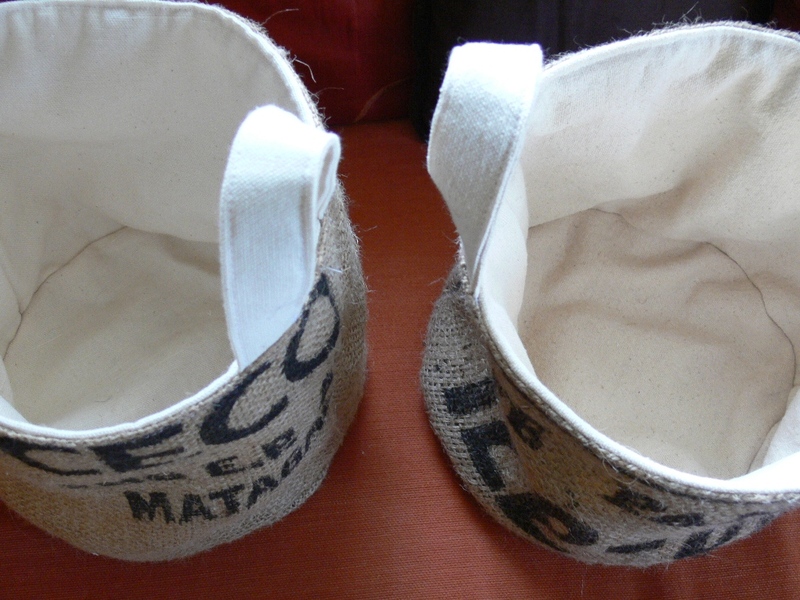 For several months, I had been lusting after those burlap buckets that Maya crafts out of recycled coffee sacks. 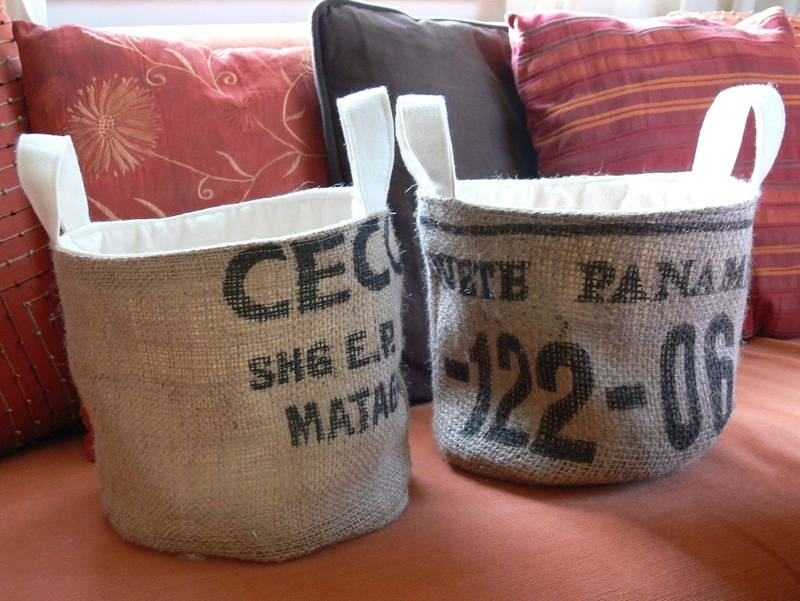 I scored a pile of coffee bags on Craigslist and decided to purchase her bucket pattern on Etsy. Dealing with Maya by email was a pleasure, she was just as gracious as she sounds on her blog. The pattern for the bucket is straightforward and the clear instructions make it super easy. Additionally, Maya provides some burlap care information, which came in quite handy. There are two sizes provided, for a medium and a large bucket. I made one, then two, then a bunch, and a bunch more for Christmas gifts (as you know!). I love this project! 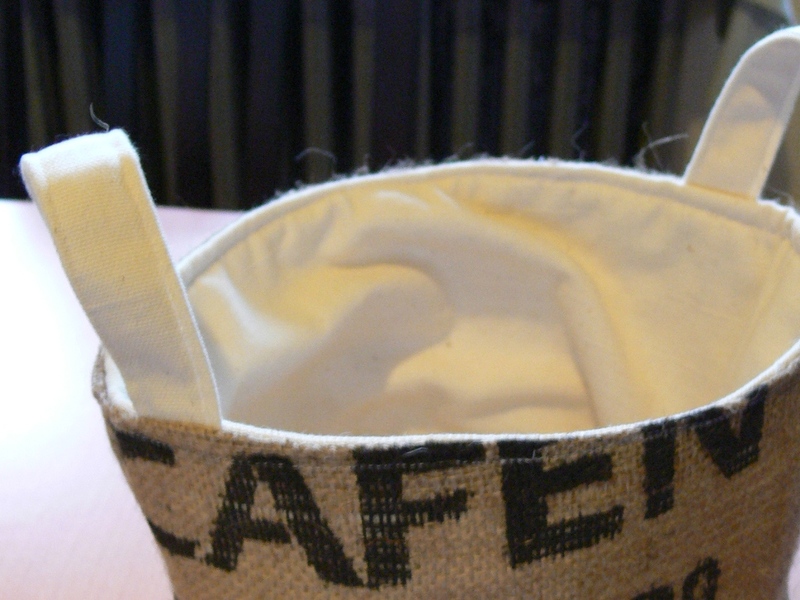 I did learn a few things in the process of making these burlap buckets. First off, working with burlap... 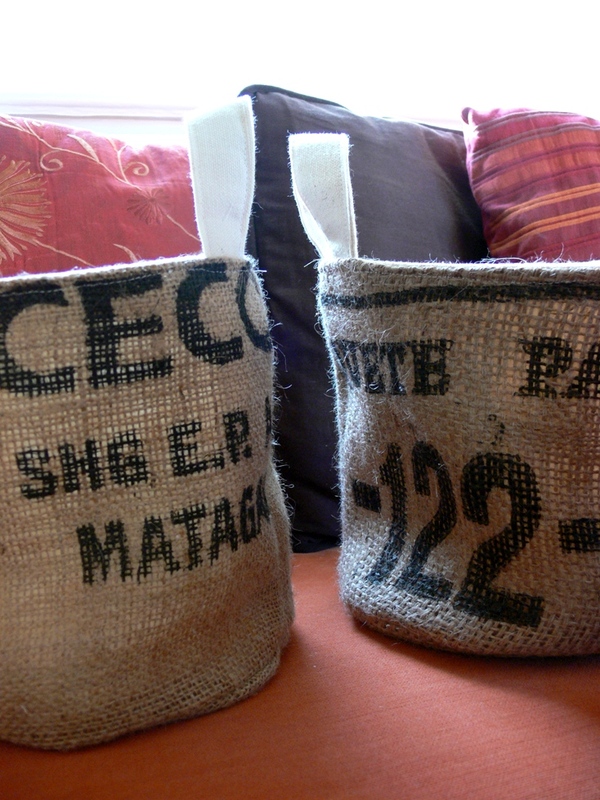 I recommend using coffee sacks instead of purchasing "fresh" burlap from the fabric store. It's a fantastic way to repurpose materials and it gives your final project a much more interesting story! Check your local Craigslist or Freecycle, or hit up a couple of your neighborhood coffee shops that do their own roasting -- I bet they'll have some sacks to unload. I would also recommend picking burlap that is tightly woven (left, in photo below) rather than a wider, looser weave (right, in photo below). It makes sewing and turning the buckets a bit more foolproof. Once you get that burlap home, air it for a while. 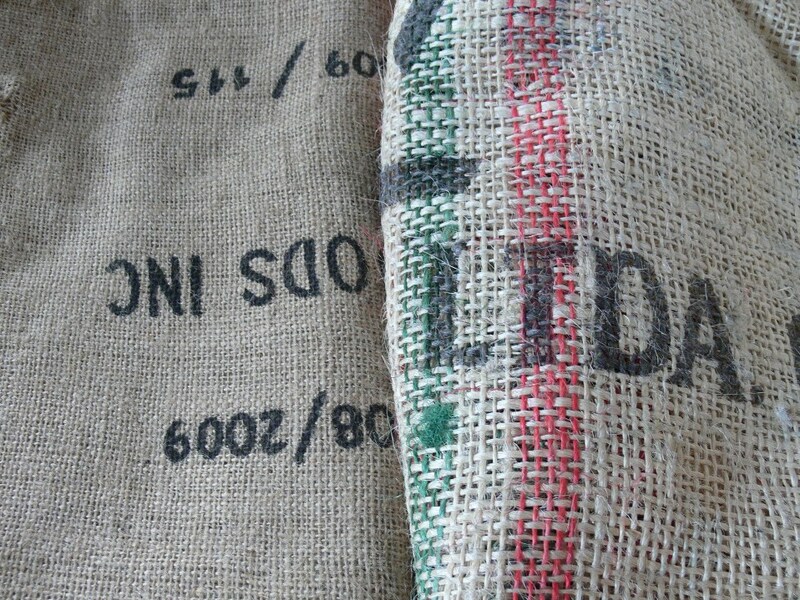 My coffee sacks had been sitting outside for who knows how long in Seattle humidity when I picked them up and smelled dreadful. I hung them out to dry and freshen up on our back porch for a couple of sunny days. All better! 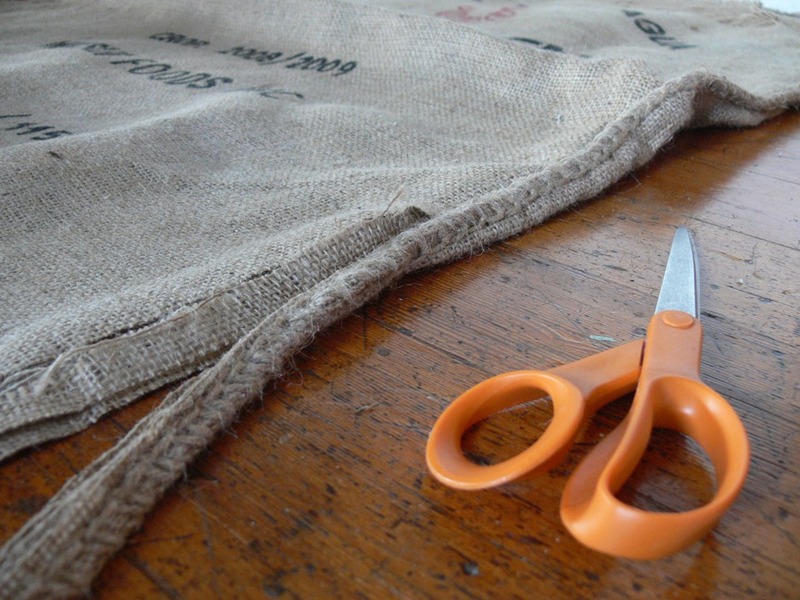 The first thing I did with my sacks is to cut off the rough seams so that I would have one flat piece of fabric. This allowed me to check for gashes and tears in the burlap, and to remove all the errant coffee beans left in the creases. Maya says you can compost jute, so toss those scraps and seams into your composter! 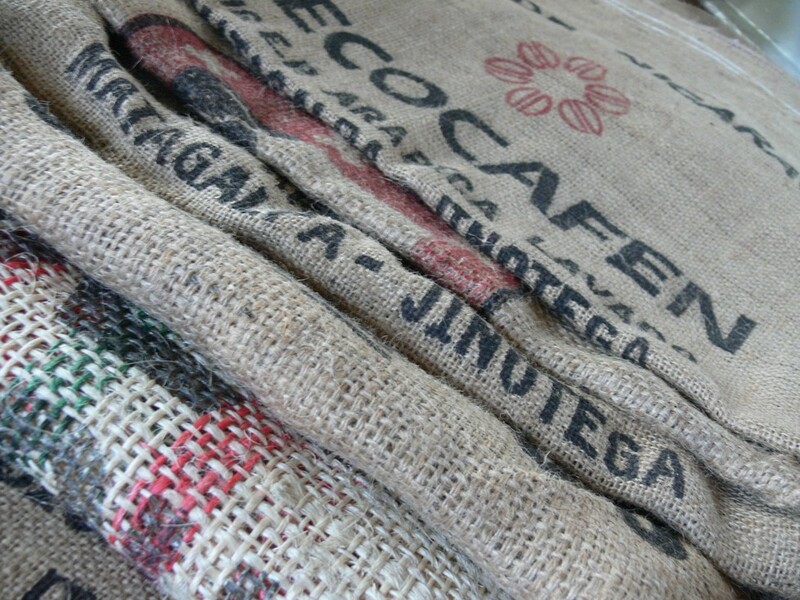 Working with the print and design on the coffee sacks was the tricky part for me. Maya recommends following the lines of the fiber and, in doing so, I made a few buckets with crooked designs. I should have been more careful. 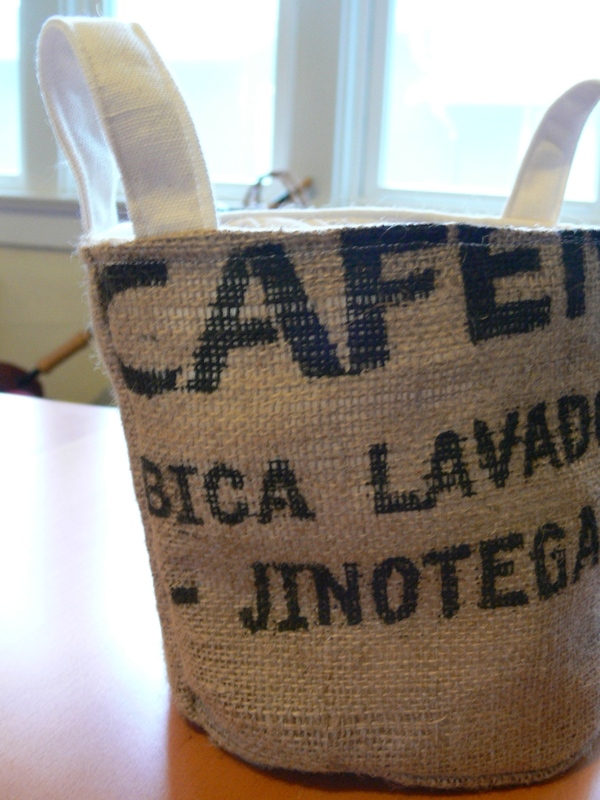 Turns out the design on a lot of those coffee sacks is not printed perfectly perpendicular and symmetrical! If I remember correctly, I think the Christmas bucket I made for your hubby was one of those far-from-straight finished products. I can't decide whether the result looks haphazardly cool, or just atrociously amateurish. I hope he likes it! For the most part, I lucked out with the prints and also learned to correct potential crookedness when cutting and sewing. Part of the charm of these buckets is that they are a little rough around the edges, just like the sacks from which they came. They do look so cool, don't you think? I used cotton batting like Maya advises, and it worked very well. For the inside fabric, she recommends designer weight fabric. I repurposed some old cotton curtains, and used a painter's dropcloth I had on hand (a very cost-efficient way to obtain a large amount of natural cotton canvas, at your nearby hardware store!). Since making all my Christmas buckets, I have adapted the pattern into a couple of other projects with mixed results. I'll post about this soon! Have you tried this bucket pattern? Have you had a chance to slice into those coffee sacks I sent you yet? What are your thoughts on working with burlap? Oh, I love Maya*Made! What talented woman. 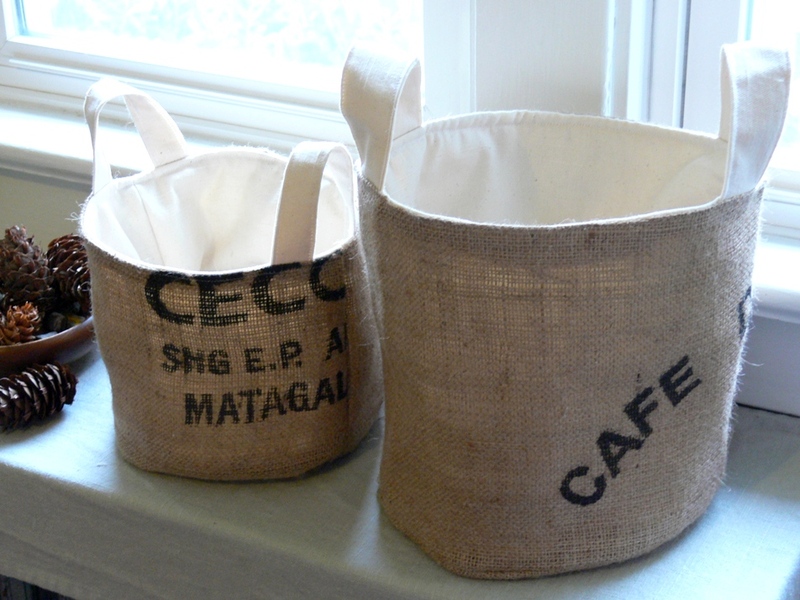 I haven't had a chance to make any of these yet, but I did air out that burlap you sent me! HOLY SMOKES that was some stinky stuff. I left it out on the clothesline through two snow storms, Lee thought I was crazy but I just told him that they REALLY needed to air out and the weather wouldn't hurt them. They're nice and clean and folded (and buried) in my craft space. I am looking forward to trying this pattern, the bucket you made for the husband is lovely. He's lucky I haven't stolen it from him yet! Making good on my first resolution, I decided to finish my Christmas works-in-progress before we put the Christmas stuff in storage until next year. 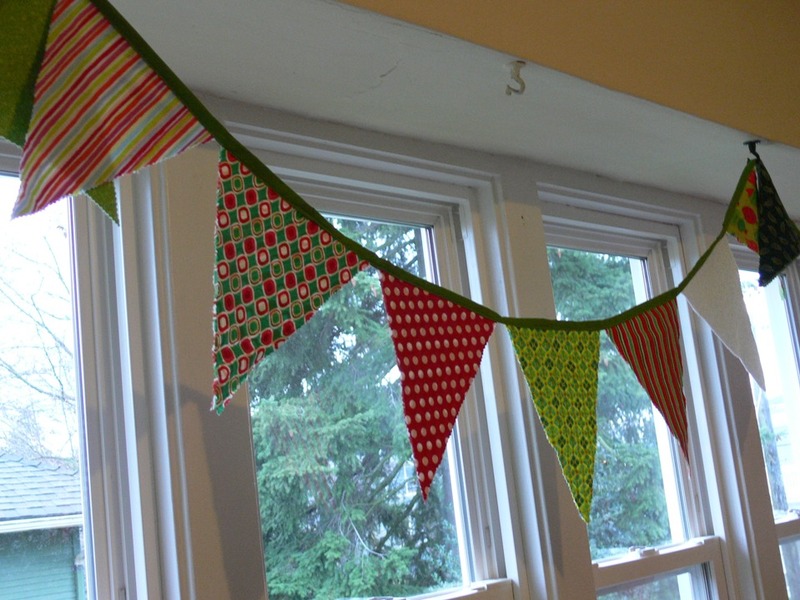 First was the Christmas bunting I've been meaning to make since 2008. Everyone else is doin' it, so why not me? It is such a super easy project and makes the room look much more festive. 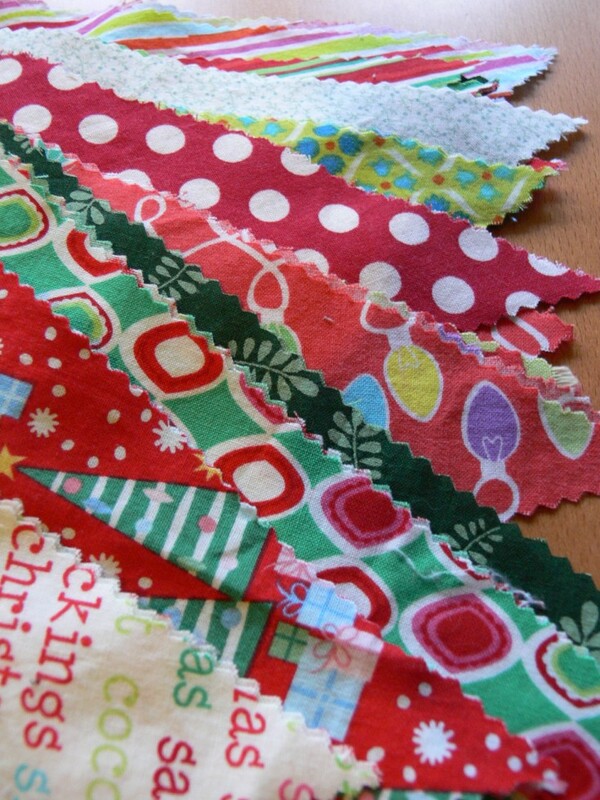 I used a variety of fabrics: a pack of modern Christmas fat quarters, some Christmas prints I found on sale, and diverse green and red fabric scraps I had in my stash (another resolution, check!). I kept my colors in the red, forest green and lime green range, mostly. I simply cut 2 triangles out of each fabric with pinking shears. I made yards, and more yards, of bias tape out of some green fabric I had. 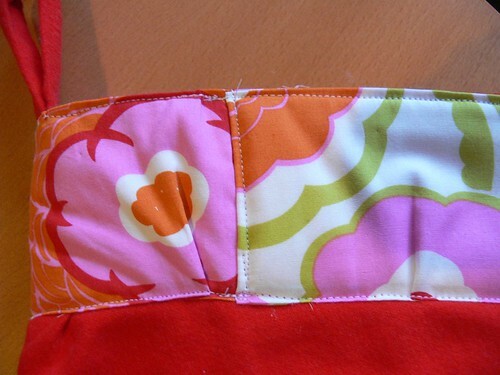 Then, I pinned the top of the triangles (wrong sides together) inside the bias tape and top-stitched all the way. 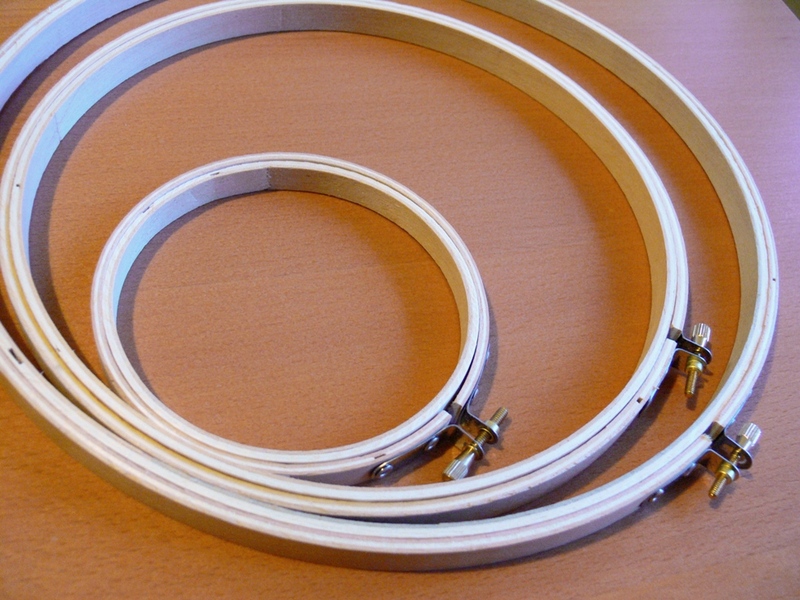 I sewed the tape into loops at either end to simplify hanging. Easy, peasy, done! 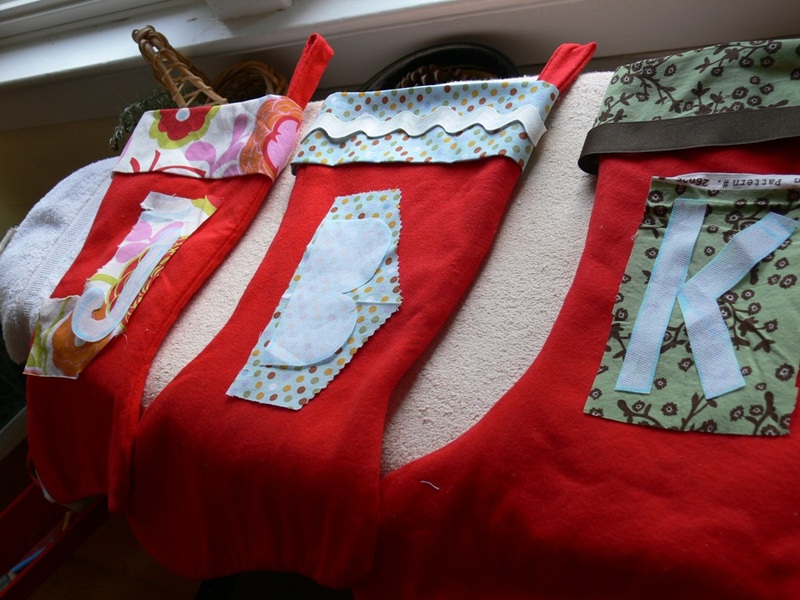 Next on my Christmas project list was finishing our family stockings. I made some basic stockings last year out of a bunch of red flannel I got for a great deal. I promised myself I would personalize and embellish them before Christmas 2009 and it didn't happen. I couldn't get away with putting those puppies in storage without finishing them! I wanted to do something fairly modern and simple, and also include each family member's initial. I was inspired by these lovely and simply sophisticated stockings on Inchmark. 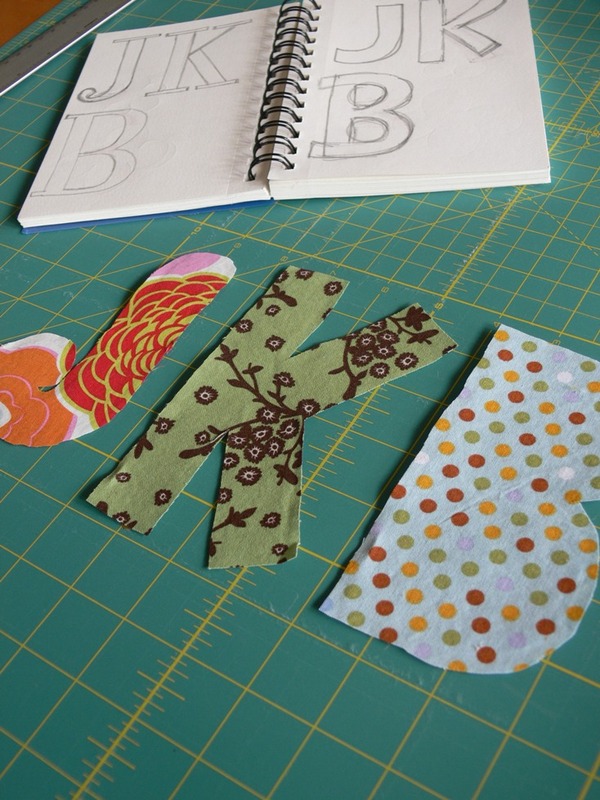 And when I saw Betz White's review of Applique Your Way with a couple of detailed photos, I thought I would just wing it and try out some applique letters. Right. First off, I picked a fabric for each person out of my scrap stash, somewhat suited to each family member's personality and gender. 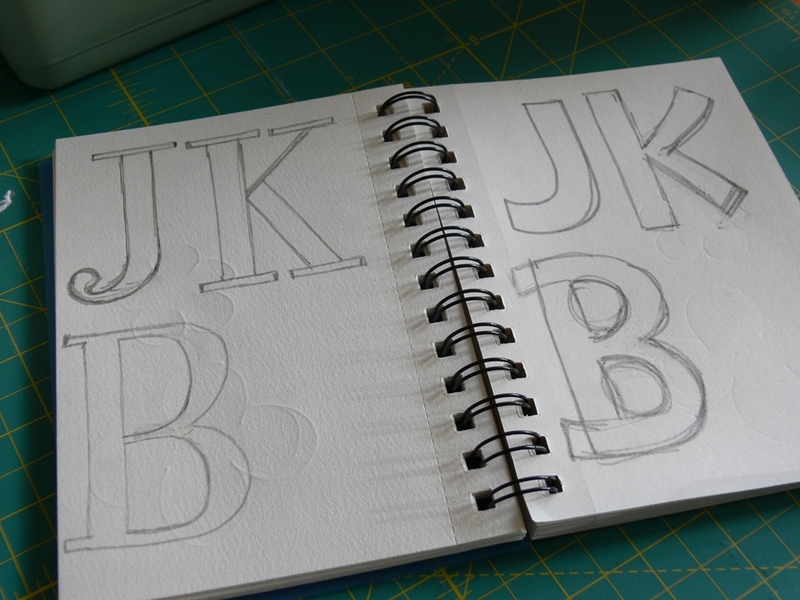 For the applique letters, I started by drawing some capital letters I liked from various font families. Next, I drew my favorite version of each on fusible interfacing and cut them out, and ironed them onto fabric scraps. 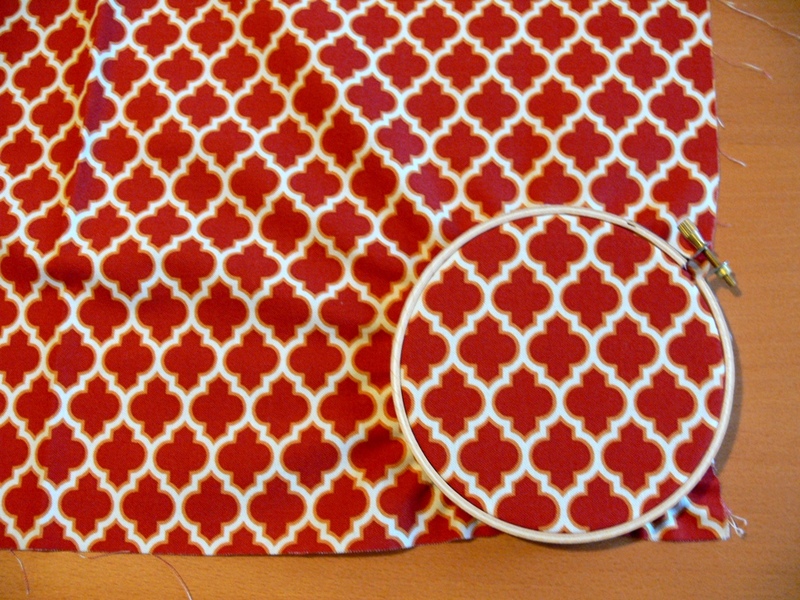 I cut the fabric a 1/4 inch around the interfacing. This is NOT how I ironed the interfacing! to give me an idea of the finished look. And this is where the fun began! 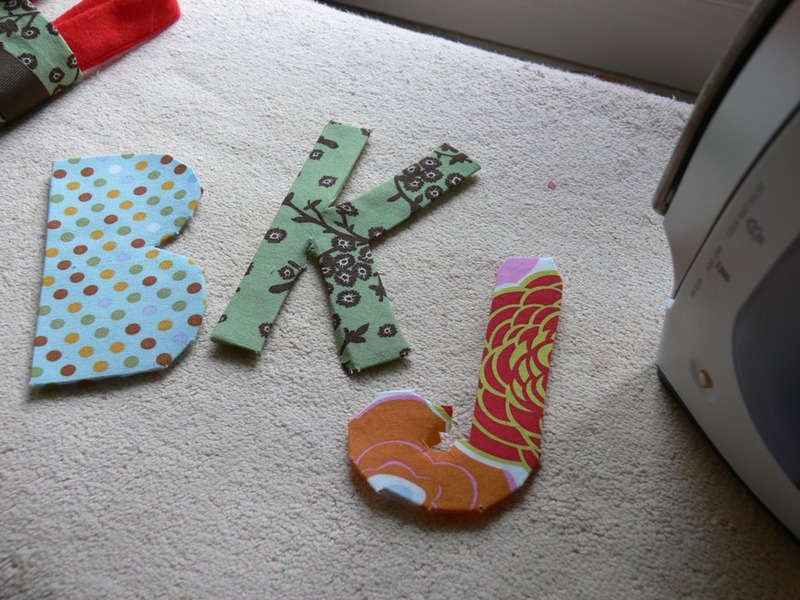 I clipped notches around the letters so that I could neatly fold the fabric and make some pretty applique. Or so I thought. It ended up looking like crap. Change of plans! 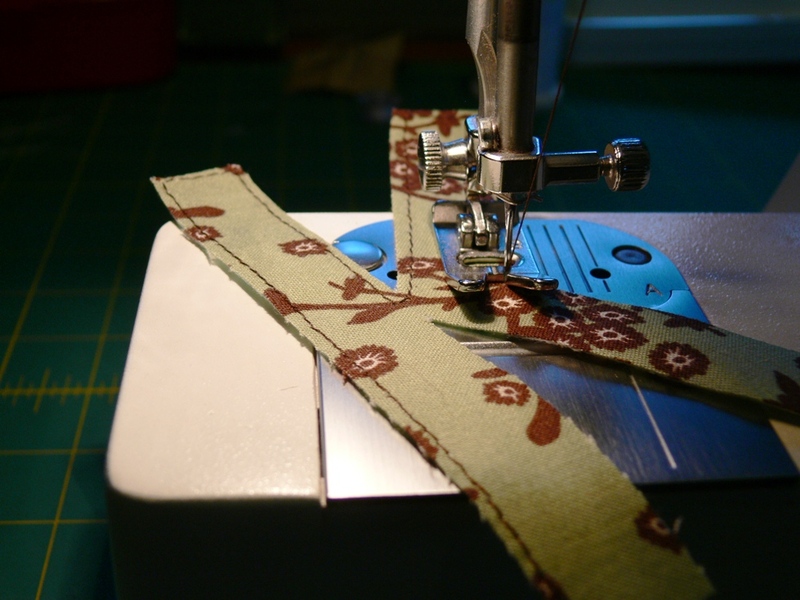 I ironed the clipped edges flat once again and trimmed very neatly along the interfacing. Since my stockings were already sewn, I couldn't bear the thought of hand-stitching each letter through the stocking tube. Can you imagine the finger-stabbing nightmare? So I top-stitched the individual letters very carefully about 1/8 inch from the edge. 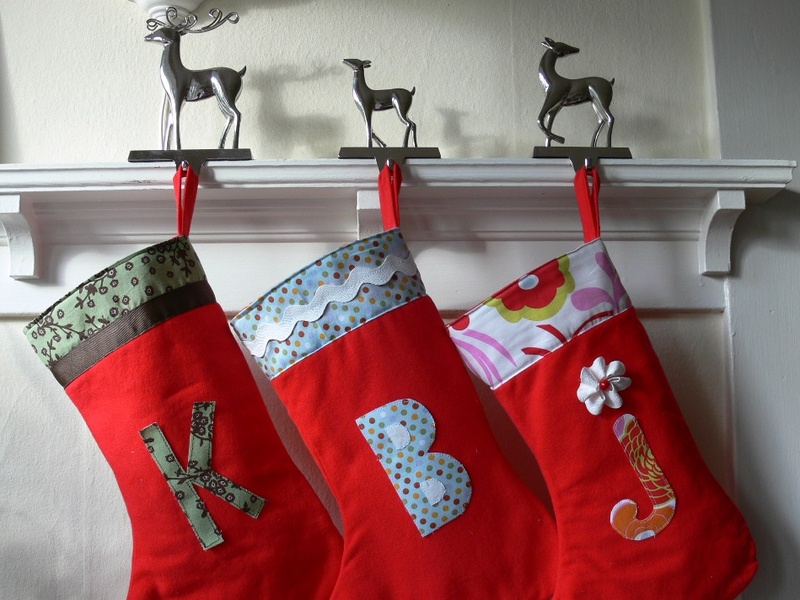 I then pasted them on the stockings with masking tape (gasp!). I'll just need to get some fabric glue before next Christmas. The top portion of the stocking was easiest. 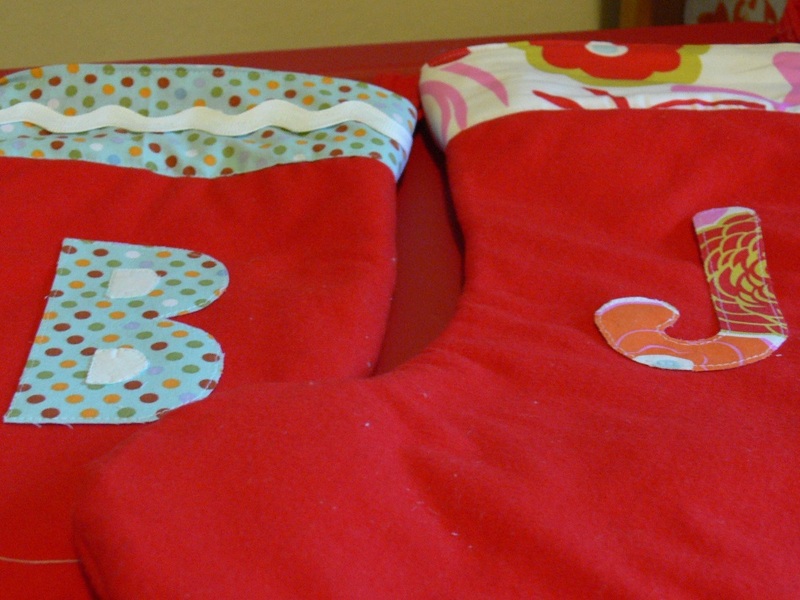 I simply cut out rectangles, folded and pressed the edges and attached them by top-stitching at the top of the stocking. On the back, I tucked one side under the other folded side and top-stitched. I focused on making the front pretty and neat, so the back has unfortunate pleats, but who cares. I added an embellishment for each person. Husband got some "masculine" brown grosgrain ribbon, baby boy got some white rickrack, and I made myself a rickrack flower (thanks Martha!) with a button center -- from the stash of vintage buttons my mother-in-law handed down to me this past summer! Overall, I'm pretty pleased with the result. Ta-da! Now we can finally put those Christmas boxes away. 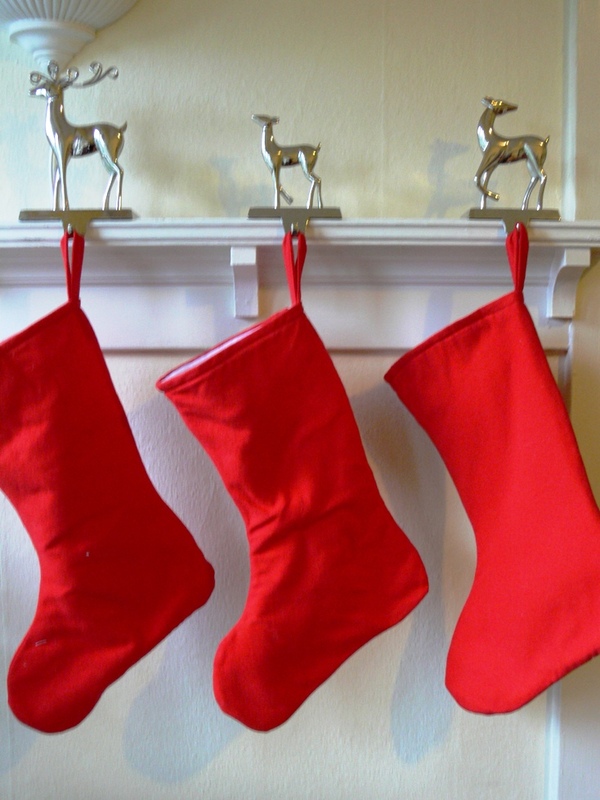 Did you get to finish your Christmas stockings before the holidays? I did get my stockings finished! I used a PurlBee pattern but did not do the embroidery. I like them *ok* but knowing me I will either embellish them somehow before Christmas or will make new ones. Because I didn't follow the pattern exactly, they ended up quite a bit smaller than I'd have liked. We love stockings in my family and tend to load them up! Yours turned out great, I love the monograms. Let's see if I can keep this simple, since I tend to bite off more than I can chew when it comes to resolutions and lists in general. 1. Use what I have! I need to start using the craft supplies I've got hoarded in my craft area rather than buying more stuff. So from now on I have to make something with supplies on hand before buying anything new to see if it satiates my need to make a purchase. 2. When I do buy new supplies, try to buy organic, natural and/or recycled or upcycled things. I'm stocking up on wool sweaters to felt every time the local Goodwill has its 50% off day each month, for instance. 3. Finish what I start. I am notoriously bad for starting a project and then leaving it to languish, half finished, for months. Ideally I'd like to finish one project before starting another one. 4. Try to create and execute original designs from time to time rather than always following someone else's pattern or idea. I seem to have a fear of wasting materials or time when it comes to making something up on my own, this year I hope to conquer that fear! 5. Organize and regularly clean my craft area. This is a constant struggle for me, but I almost have it organized the way I want it! But when it's constantly in disarray and is always dirty it means the few spare minutes I might have to make something during the day are spent trying to find what I need, or even trying to find a place to sit down! Happy 2010! I am bursting with resolutions for the new year. I love the fresh start that comes with a new January -- and a new decade to boot! Here is the list of my crafty goals for the coming 12 months. 1. Finish all existing works in progress and finish what I start. 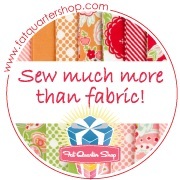 That includes sewing projects, knitting projects, art projects -- apply liberally. 2. 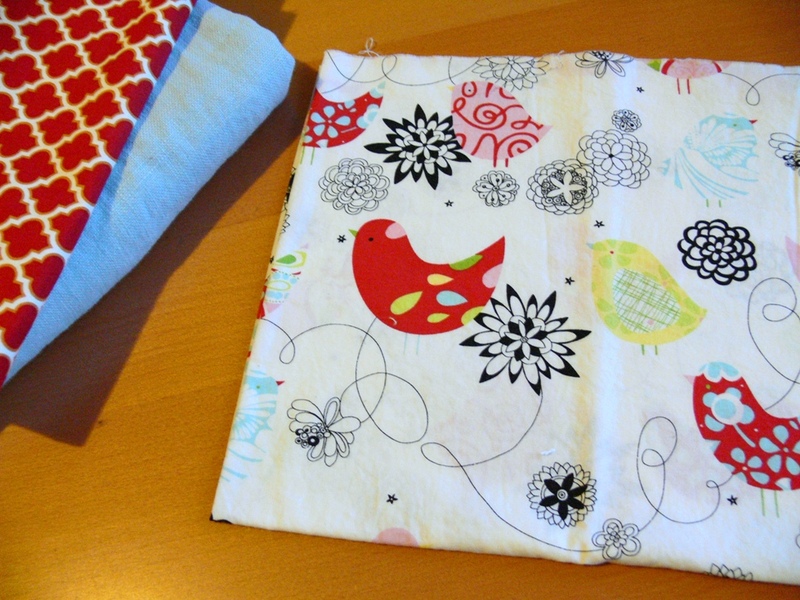 Make all household linens. By this I mean, everything but clothing, towels or sheets. 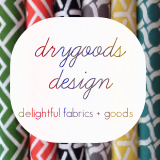 On the list are curtains, play mats, toy storage, table runner, pillow covers, napkins, and more! 3. Aim to post at least once a week here about a new or ongoing project. 4. Make more gifts than last year. 5. Not wait until the last minute to make Christmas gifts or Christmas decorations. Like, start in July. 6. 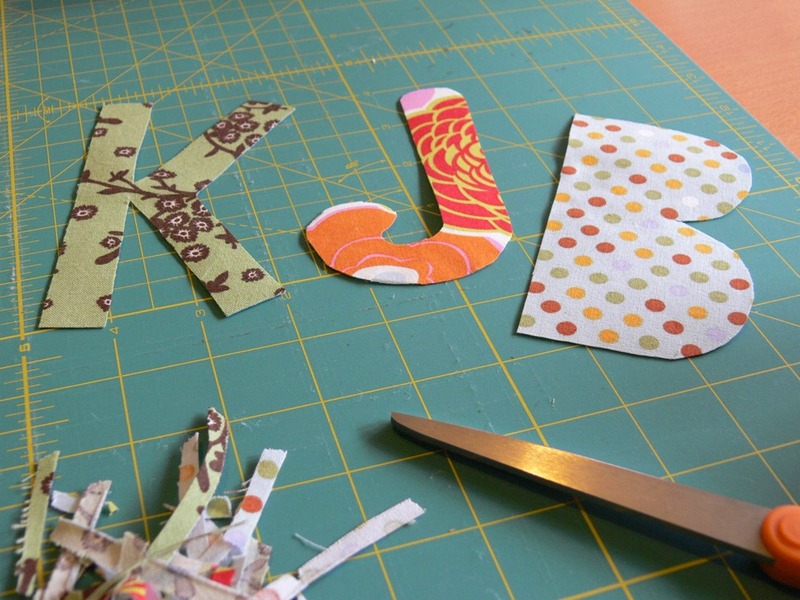 Learn how to needle-felt, how to knit cables, and how to applique. 7. Start (and ideally finish) first quilt. Woohoo! So excited about this one! 8. 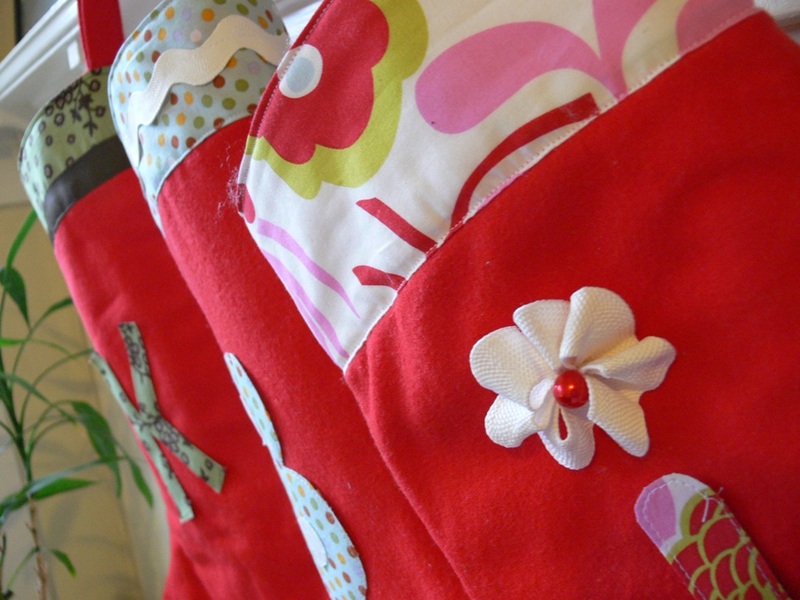 Come up with as many uses as possible for all those awesome fabric scraps. 9. 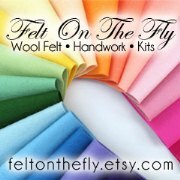 Use stash fabric and supplies before I buy more. 10. Be creative, stay positive, and make it happen! 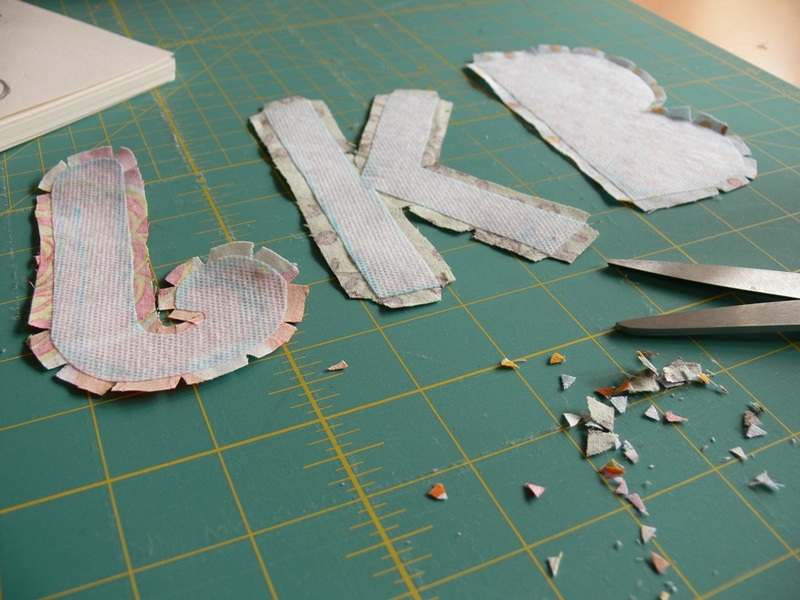 What are your crafty resolutions, my friend? All right, friend! Here is our little blog. Are you ready to start showing me and the virtual world what you've been working on while the kids are napping? We are 2 friends and crafty mamas who met each other in Nashville, Tennessee. We are both pretty consistently productive and creative with various projects, and used to share and help each other with them. Until my family and I moved to Seattle, Washington a couple of months ago! This blog is now our place to share what we're working on and what we're learning in the process, in hopes of motivating and inspiring each other -- and perhaps others as well.